ICIWaRM, through the Institute for Water Resources (IWR) of the US Army Corps of Engineers and their Hydrologic Engineering Center (HEC), has engaged in a series of multi-day workshops and other related activities to “train-the-trainer” in both technical and policy areas to support integrated water resources management. 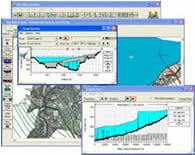 HEC is a world leader in hydrologic and hydraulic modeling; its models and documentation are downloadable without charge from the internet, and are widely used throughout the world. ICIWaRM-HEC workshops have been conducted in multiple languages across several continents. The intent of such workshops is to build capacity in developing areas such that the relevant ministries or other water resources organizations have the capability to apply the world leading technical tools developed by USACE without the need for permanent assistance. In 2007, the governments of Ethiopia and Kenya requested training in a number of topics including hydrology, hydraulics, and the HEC software used in these fields. In response, with funding from the Naval Facilities Command (NAVFAC) and Task Force Horn of Africa, HEC personnel conducted a series of workshops in these two countries from 2007 to 2009 on topics such as Introduction to Modeling, Watershed Modeling, and, in collaboration with groundwater experts from the U.S. Geological Survey. The initial workshops were focused on the water ministries of Kenya and Ethiopia, and trained ministry employees in the HEC suite of hydrologic and hydraulic models. Follow-up work on hydrologic modeling of the Ogaden Basin in Eastern Ethiopia is ongoing. ICIWaRM has continued to provide modeling training, for example, in 2011 in Asuncion, Paraguay in conjunction with the International Hydroinformatics Centre at Itaipu (CIH). The course was a seven day workshop that featured theory, applications, tips in hydrology, hydraulics, and reservoir operation all conducted in Spanish. Multiple days of applied problem solving as well as advice from HEC engineers on ongoing projects followed. In excess of 40 participants from Paraguay, Brazil, Uruguay, Argentina, and Chile attended the workshop. In 2014, ICIWaRM held three separate courses, in Guatemala City, Guatemala, Santo Domingo, Dominican Republic, and La Plata, Argentina. The first two of these were also written up (in Spanish) by UNESCO’s Regional Office of Science and Technology for Latin America and the Caribbean. The latter focused on modeling environmental flows and was given in support of the Erasmus Mundus Master of Science in Ecohydrology, at the Universidad Nacional de La Plata. And in 2016, HEC subject matter experts supported by ICIWaRM taught a hydrologic and hydraulic modeling course at the ASCE-EWRI 8th International Perspective on Water Resources and the Environment Conference in Sri Lanka, January 3-6, 2016. The audience included students and professors interested in sharing the modeling knowledge as well as practitioners hoping to use the modeling software to support their water resources planning projects. In addition to technical workshops, ICIWaRM, in collaboration with IWR, also supports more policy-based workshops focused on improved water resources planning. For example, in early 2017 ICIWaRM co-organized a technical workshop on climate change risk, vulnerability assessment, and early warning for the AGRHYMET Regional Center in Niamey, Niger. In Accra, Ghana, ICIWaRM collaborated with Deltares to conduct hands-on training in the use of collaborative modeling to support IWRM. In Bangkok, Thailand, ICIWaRM cosponsored the third ASEAN academic network technical training workshop for water and disaster management. And in January 2018, ICIWaRM participated in UNESCO’s Regional workshop on climate services for improved water resources management for Southern Africa. With access to subject matter experts in both technical and policy areas of integrated water resources management, ICIWaRM looks to build capacity via short and long-term trainings and workshops worldwide. For further information regarding technical trainings using HEC models, please contact Chris Dunn. For further information regarding other technical or policy trainings, please contact Will Logan.